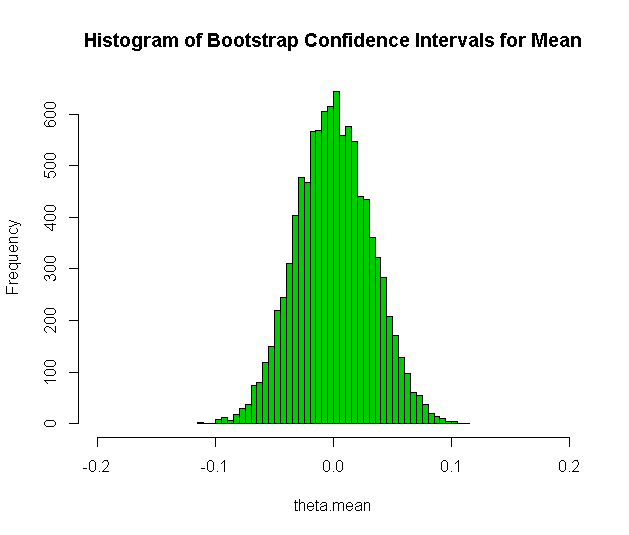 Here is an example of nonparametric bootstrapping. It’s a powerful technique that is similar to the Jackknife. With the bootstrap, however, the approach uses re-sampling. It’s clearly not as good as parametric approaches but it gets the job done. This can be used in a variety of situations ranging from variance estimation to model selection. John Tukey, as the story goes, suggested the name “the shotgun” because you can blow the head off any statistical problem. The code below is for illustrative purposes and compares a couple of different approaches for bootstrapping. The mean shows a very nice distribution but something like a median is not so symmetrical The code below can easily be changed to allow for any single statistic (e.g. any percentile). A little bit of alteration and bivariate statistics (e.g. correlation) can be bootstrapped. One can observe that it is quite simple to obtain the confidence interval directly. 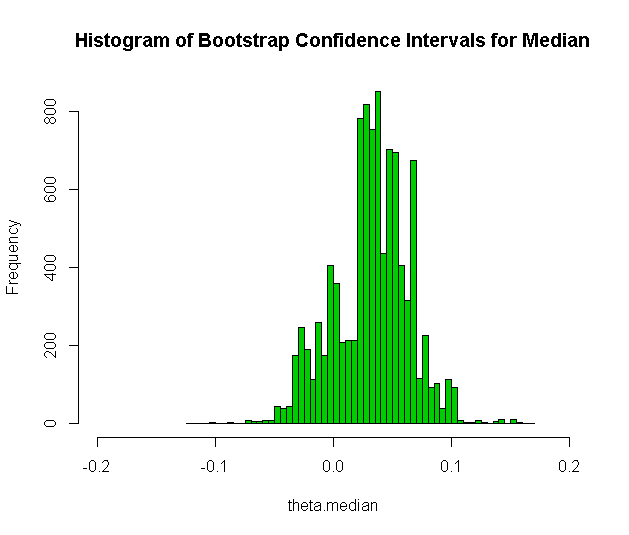 By using nboot=10000 (or any other number that can easily be divided) it makes it quite simple to find the confidence interval by merely taking the alpha/2 and (1-alpha/2) percentiles; in this case below the 50 and 9950 positions.